Archery is a beautiful sport, and bows and arrows are an ancient, primitive weapon that have unknown origins, but have been around since the dawn of time. Modern compound bows are extremely technologically advanced, sophisticated, and are exceptionally powerful. People use compound bows to hunt and for target practice, or sometimes to get rid of pests on property. The modern designs and raw strength found in the newest generations of bows give archers many more features than the bows and arrows of yesteryear. The first compound bow was created in 1966, by a man named Holless Wilbur Allen from Billings, Missouri. He was granted a patent in 1969. 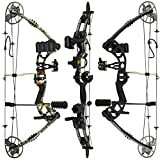 Currently, bow manufacturers like Elite Bows and Bear Bows and Bear Archery dominate the market. In archery, the modern compound bow uses a number of features that allow it to operate with extremely magnified power and force over a traditional bow. The use of the term compound bow was around before the modern version was created and was applied to composite bows. This term is now outdated for use with composite bows and applies only to the patented modern design. Levering System. Compound bows have a levering system constructed of pulleys and cables to produce a bending action on the limbs. Stiff Limbs. The use of a pulley and cam system provides the archer with a mechanical advantage, so the limbs of a compound bow are significantly stiffer than the limbs of a longbow or recurve bow. Bow Strings and Cables. 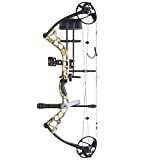 Compound bow strings and cables are typically made of high-modulus polyethylene, and will not stretch and are very tense, so there is little play and a great degree of strength. Cams. There is usually a cam or wheel at the end of each limb in most archery bow models. The shape of this cam will vary considerably from model to model. Arrows. Usually made from carbon fiber, aluminum alloy or a composite of these two materials, the arrows for compound bows do not typically vary from those that are used in common recurve bows. Safety is the highest priority for every user of compound bows. You need to be properly trained or using them under the supervision of an instructor who is qualified. Without knowing how to use these bows, you can receive serious injuries or die. Always wear safety glasses when shooting bow or repairing it. Carefully inspect before each and every time before you use it. Be aware of the condition of your bow prior to use, perform routine maintenance and make necessary periodic repairs. Replace broken or damage risers, limbs, or cams when needed or report them to your dealer. The use of a damaged bow may result in serious injuries or additional damage to bow. Replacement of parts such as bowstrings and stabilizers need to be performed on a schedule to maintain safe use. Never dry-fire your compound bow. This means you should never draw back and then release the bowstring without the presence of an arrow, doing so can cause damage to your bow and result in serious injury. Keep away from moisture or high heat at all times. High heat may create failure of the components. When not in use, make sure your bow is always properly stored. Usually damages caused by owner negligence will not be covered by any warranties. Never change or modify bow. Never modify your components as this can cause safety concerns and will void your warranties. Bows do not require modifications. Make sure you are firing in areas with adequate backstop. Never fire in an area with children, pets, people, or property if there is any potential for injury. Arrow strikes can be fatal, and while archery is a sport to be enjoyed by all, a bow and arrow is a serious weapon much more than a toy; keep that in mind while using. It is recommended that you must only shoot arrows that feature the arrow point at least 2 inches past the bow shelf. Inspect all of your arrow before you attempt to use them. If defects such as splintered, dented, or cracked shafts appear, make sure and discard the arrows and do not use them, as they can be dangerous if damaged. How to Improve Your Bow Hunting Skills?